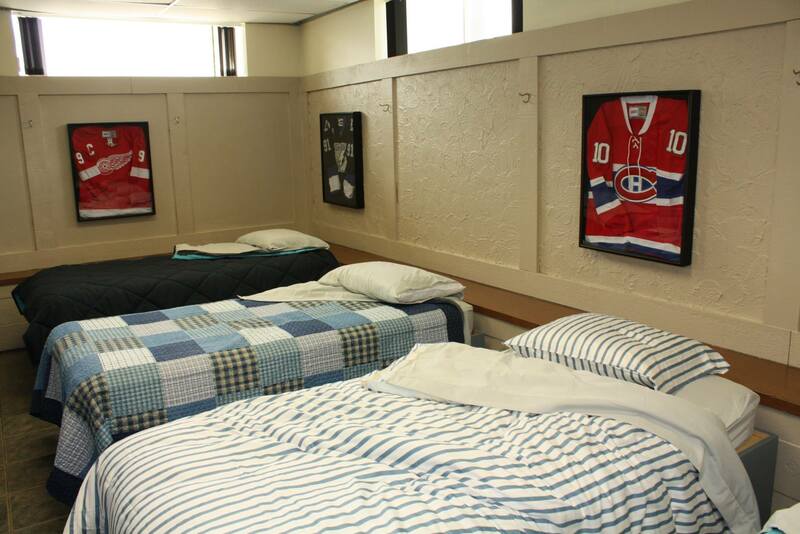 The Lighthouse provides emergency shelter for Saskatoon’s homeless men and women in two separate dorms. These emergency shelters are for individuals 16 years and older who either have nowhere to call home or their living situation is such that it is safer for them to be in a shelter. Reasons clients may access our shelter services include evictions, financial setbacks, domestic violence, concurrent disorders, addictions, etc. Clients are given a safe place to sleep, a place to store belongings, and supports to help them find employment (if needed) and long-term housing that is safe and sustainable. Using a Housing Plus philosophy, we offer the supports they need to figure out their next steps. The men’s emergency shelter offers short term and emergency room and board to men with little or no resources. It has a total of 17 beds and houses men 16 years and older. Upon admission, men are given a pillow, sheets, and bedding for the night. If needed we provide personal hygiene products and make sure they are aware of our Personal Needs Room which offers free clothing and other goods if they need it. In the morning men are woken up in time for a shower and to take advantage of a hot breakfast. The shelter dorm is closed from 9:00 a.m. to 8:00 p.m. daily. While it is closed, our common area and lounge are available for clients. 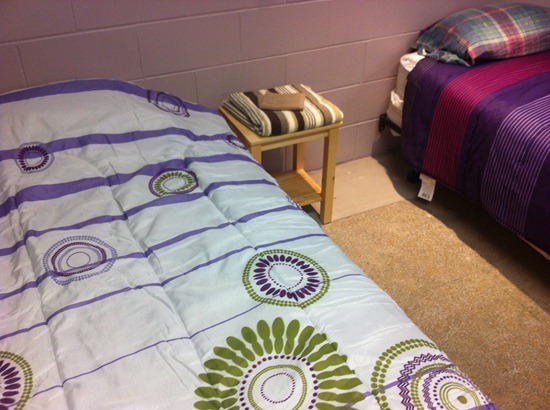 The Lighthouse provides emergency shelter for Saskatoon’s women in a recently built dorm. This emergency shelter is for women who have nowhere to call home or their living situation is such that it is safer for them to be in a shelter. The causes range from people who have just had a bad series of events set them back financially, domestic violence to a series of concurrent disorders. They are given a safe place to sleep, a place to store belongings and supports to help them find employment (if needed) and long term housing that is safe and sustainable. 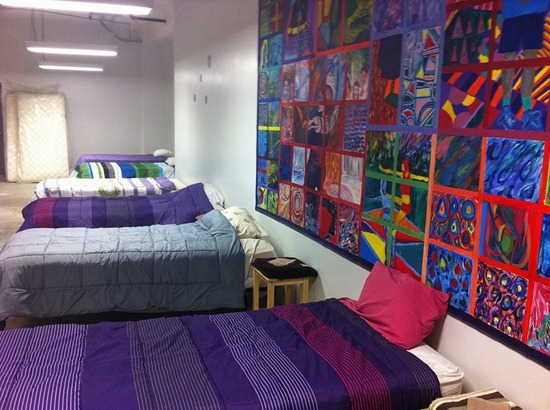 The women’s emergency shelter has a total of 20 beds. Upon admission women are shown their bed for the night while staff ensure that they have everything they need to be comfortable. If needed we provide personal hygiene products and make sure they are aware of our Clothing Depot which offers free clothing and other goods if they need it. In the morning the women are woken up in time for a shower and to take advantage of a hot breakfast. Since it is a congregate setting, we do everything we can to make it comfortable for the women with everything from a snack when they arrive to free ear plugs to help them get a good night sleep. The dorm is closed from 9:00 a.m. to 8:00 p.m. daily. Residents still have access to washrooms, lounges, meals, a telephone, and internet access during the day. Our emergency shelter beds are closed during the day from 9:00 AM to 8:00 PM. A locked storage room is available for client belongings. Clients can access their belongings during storage times five times per day at: 8:30 AM, 12:30 PM, 4:30 PM, 8:30 PM and 10:30 PM. The lounge is open during the day for residents. We have a big screen LCD television, comfortable sofas, tables and chairs, and some desktop computer for residents to put together resumes, surf the web, check email, and look for employment and rental units. For residents who do not have cell phones, we do provide a landline in our lobby for residents to make phone calls on, for long distance phone calls we have a VOIP enabled phone which makes it far more affordable for them to keep in touch with friends and family around the world. For more information on The Lighthouse Emergency Shelter services, contact Front Desk at 306.653.0538 or at housing@lighthousesaskatoon.org.